Happy New Year! And Here's to a Great 2013! Well, the annual family book exchange is over. We all had a great time getting together to chat. Here are my brother in Dallas and my uncle in Baltimore catching up the new-fangled way. And here is my other uncle and cousin showing them the book my uncle had just picked from that big pile on the floor. We had 22 books in the hopper this year, and here's the one I came away with. I liked the Harry series so will have to give this one a try in the new year. But before we get too far into the new year I just wanted to thank all of you friends of Reading With Scissors who helped make this year such a fun one for me. I put away enough money folding books that I was able to surprise Captain America with a new bike for Christmas. And look at the fancy-dancy tag I made to put on it. It kind of fell apart as you can see. Maybe if he could have waited for the glue to dry before I gave it to him. But the kids didn't get to our house until late afternoon and he was going crazy not being able to open a present, so I gave him the bike before they got there. Speaking of gifts a few years ago my parents established a scholarship in my name at my alma mater. 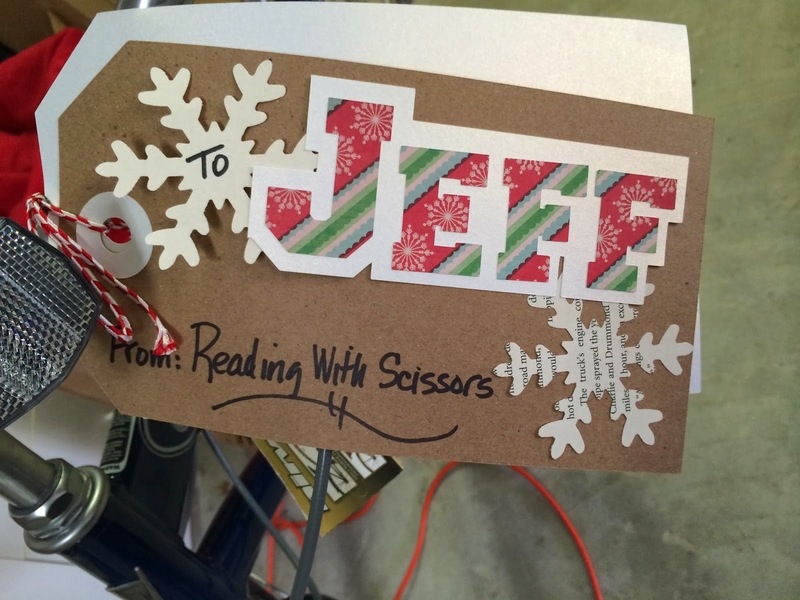 And thanks to your help, this year Reading With Scissors was able to make a very nice contribution to the Stephanie Dahlem Pounds Endowed Scholarship. Thank you for sharing all the book-folding fun with me in 2013 and for buying more than a few of works. Here's to more fun in 2014! Here we go! I am reading this book right now about this plane that went down in the Dutch New Guinea jungle toward the end of World War II. The survivors of the crash met up with island natives who had had no contact with the rest of the world--ever. In today's passage the author is describing the natives and reported that they could only count to three and after that everything was "many." At least you would have believed it if you had been at my house this week when I was baking for the annual cookie exchange. Remember last year's exchange? Well, this year was tons better because now I have DIL#1, my daughter-in-law, to help me bake. Our recipe this year was Caramel Apple Cider Cookies that we stole borrowed from our soon-to-be cousin over at A Little Alana. Kudos to cousin Paul for snagging someone with such mad baking skills. We will be stealing stuff from Alana for the foreseeable future. The recipe starts with caramel, and frankly we could have just stopped right there and had a winner in my book. The hardest part of the whole baking process was making sure we had enough caramels to fill 7 dozen cookies. But that's where the problems started. I was never great at my 7 times table and a total loser at my 12s. As the good people in New Guinea would have said, "We just need many." ...but the hardest part was flipping them upside down to cool to keep the caramel from sticking to the rack. I take that back. The hardest part was not popping every one of those gooey bites of deliciousness in our mouths before we got them wrapped up. After the cookies were done we started punching out snowflakes for our cookie bags, like these. The plan was to punch two small flakes from yellowed paper and one large flake from whiter paper. Earlier in the week I had gone to Michael's to get the large and small punch. When I got home I realized that I already had a large snowflake punch, so I took it back. I took the snowflakes to my craft room to glue them on the bags. I laid out the 12 large white and the 24 large yellow. Wait. There were supposed to be 24 small yellow. I checked the punches. I checked the snowflakes. All the snowflakes were the same size. Then I looked again. The large punch and the small punch were both 3" punches. So yep you got that right--I bought three snowflake punches and all three were 3" punches. Even my New Guinea friends could have counted that! It would have to do. Next, I ran to the store to get ribbon to tie the bags shut like this. And in the end they looked like this. "Let's snow?" Really? I've never snowed before. So I maybe I can't do math, but I can do English. Captain America even got in on the act and help me fill the bags with cookies. He was not a fan of Caramel Apple Cider cookies ("Why can't you just make chocolate chip?? "), and threatened to add Cheetos to each bag so recipients would have options. He needn't have worried. After an hour of everyone tasting delicious cookies of all kinds at the cookie exchange, the Caramel Apple Cider cookies all found good homes. And the fun part was I came home with 12 new kinds of cookies for to share with DIL#1 and munch on this holiday season--AND a new cookbook full of cookie recipes. Captain America and #1 Son liked that part especially. It's December! Time for giving and receiving. Decorating, wrapping, and surprises! So what could be behind this festive red cover? It's a "Twas" book for my friend, Sharon. Remember when I made one of these last year? Well, Sharon wanted another...but with a twist. Literally. ...I twisted the design to buy us just a little more room in the bottom corner. Then I used my handy-dandy Silhouette machine to cut out the words to finish the thought! It turned out really nice, I think. The original red endpaper was in great shape and just the right color to match Sharon's "Twas the Night Before Christmas" dishes in her December dining room hutch! I like this new technique and when I get time, I'm going to try it again with more phrases. Can you think of any good phrases you'd like to see? Which word would you fold and which would go on the endpapers?